Trump Tower serves as the headquarters of The Trump Organisation. 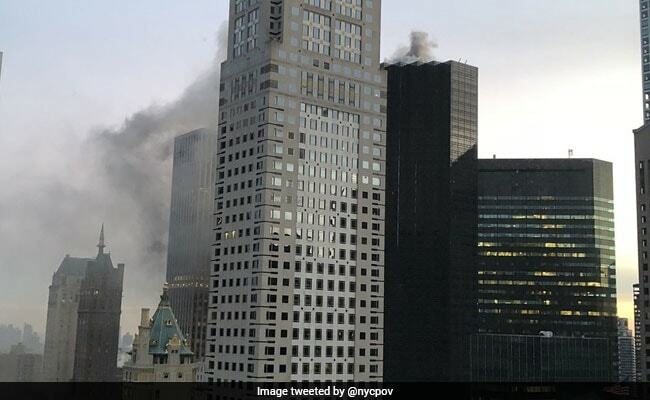 Two people were injured, one seriously, in an early-morning fire near the top of Trump Tower in midtown Manhattan, the New York Fire Department said on Monday. Although local media initially reported there were no injuries, one person sustained a serious, possibly life-threatening injury, and another had a minor injury, the Fire Department said. Eric Trump, one of the president's sons, said on Twitter that it was a small electrical fire in the cooling tower on the building's roof. "The New York Fire Department was here within minutes and did an incredible job," said the younger Trump. "The men and women of the #FDNY are true heros and deserve our most sincere thanks and praise!" The fire was reported by phone shortly before 7 a.m. EST (noon GMT) on the top floor of the 68-story structure, which had been Trump's primary residence before his election victory and inauguration nearly a year ago, the department said. More than 90 minutes after the initial report, 84 firefighters and 26 units were still on the scene, according to department spokesman Firefighter Ken Reilly.